Fakhreddin Azimi was born in Iran; he achieved the highest grade in the country-wide university entrance exam in the field of humanities and graduated (first class) from the School of Law and Political Sciences, Tehran University, where he edited a student journal to which faculty and well-known intellectuals contributed. Moving to England, he received his M.Sc. from the School of Oriental and African Studies, University of London, and his D.Phil in 1985 from St. Antony’s College, Oxford University, where he had the opportunity to work with A.H. Hourani, among others. He joined the University of Connecticut in 1991. 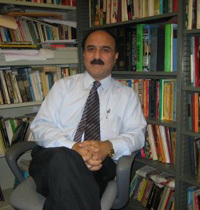 His primary focus of research is the politics, society and culture of modern Iran. He is a Fellow of the Yale University Iran Colloquium. In addition to teaching courses on both the medieval and modern Middle East, Azimi is interested in historiography, the epistemology of history and the exploration of the conceptual and theoretical contribution of the social sciences to the task of historical investigation. He teaches a graduate seminar on history and theory. Hakemiyat-e melli va doshmanan-e an (National Sovereignty and its Enemies: Probing the Record of Mosaddeq’s Opponents) (Tehran: Negareh-ye Aftab Press, 2004). Ta’ammoli dar binesh-e siasi-ye Mosaddeq (Reflections on Mosaddeq’s Political Thinking), (Tehran: Khojasteh Press, forthcoming). Iran: The Crisis of Democracy, 1941-53 (New York & London 1989); revised paperback edition in process. Bohran-e Demokrasi dar Iran, 1320-1332 (Persian translation of the above by A. H. Mahdavi & B. Nowzari), revised and new introduction (Tehran: Alborz Press, 1994). “Historiography under the Pahlavis”, in Persian Historiography, ed. Charles Melville, forthcoming. “Unseating Mosaddeq: The Configuration and Role of Domestic Forces”, in Mark J. Gasiorowski and Malcolm Byrne (eds. ), Mohammad Mosaddeq and the Coup of 1953 in Iran (Syracuse University Press, 2004), pp. 27-101, 286-303. “Diverse Approaches to Iranian Historiography”, The Historian, spring/summer 2002. “On Shaky Ground: Concerning the Absence or Weakness of Political Parties in Iran”, Iranian Studies, vol. 30, no. 1-2, winter/spring 1997-98, pp. 53-75. “Amir Agha: an Iranian worker”, in Edmund Burke III (ed. ), Struggle and Survival in the Modern Middle East (University of California Press, 1993), pp. 290-304. “Musaddiq, Iranian Nationalism and Oil”, in K. Pirouz (ed. ), Musaddiq, the Politics of Oil and American Foreign Policy (New Jersey, 1993). “Workers and peasants in modern Iran”, International Labor and Working Class History, no. 36, fall 1989. “Musaddiq: the reconciliation of ethics and politics, nationalism and democracy”, in James A. Bill and Wm. Roger Louis (eds. ), Musaddiq, Iranian Nationalism and Oil (University of Texas Press, 1988). “Great Britain’s Influence in Persia: 1941-“, vol. XI, Fascicle 3 (2002), pp. 234-46. “Elections under the Qajar and Pahlavi monarchies, 1906-79”, vol. VIII (1998), pp. 345-50. He has also contributed to many other encyclopedias, and has given numerous interviews to international broadcasting organizations, particularly the BBC. Azimi has written extensively in Persian on a variety of historical and theoretical topics, in collected works and in journals such as Negah-e Nou. He regularly visits and conducts research in Iran, and has maintained an active presence in Iranian intellectual and scholarly circles.